A characteristic feature of the Costa del Sole is the regular presence of granite crowned by metamorphic contact rocks where rockrose garigue, rosmary, lavender, helichrysum, maquis and vine terraces abound. 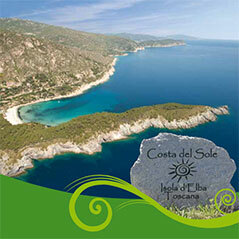 Small bays protect villages like Chiessi and Pomonte where Elba peasant traditions live on. Ten Km of scenic roads with views over the Archipelago and Corsica criss-cross the whole of the Costa del Sole, enchanting bays with equipped beaches, low rocks and high cliffs, small beaches accessible only on foot or by boat. Breathtaking views and never-ending sunsets will leave you with unforgettable memories.